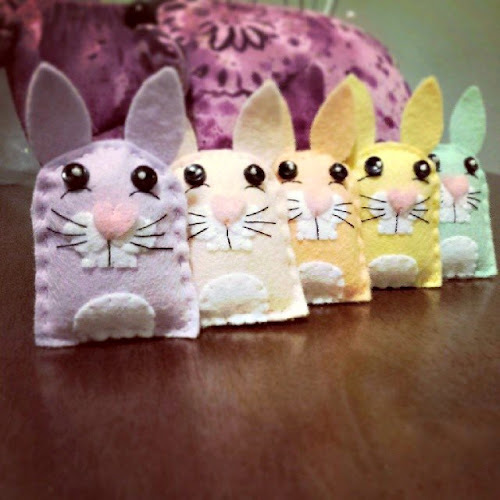 If you loved making the Spring Bunnies from my earlier tutorial then you'll love what you'll be able to do with them next! 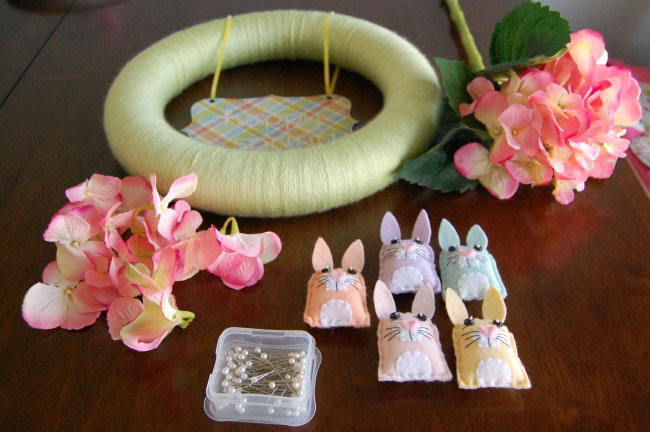 Adding your felt Spring Bunnies to this yarn wrapped wreath makes a delightful accent to any wall. Follow the steps below for instant cuteness! 1. 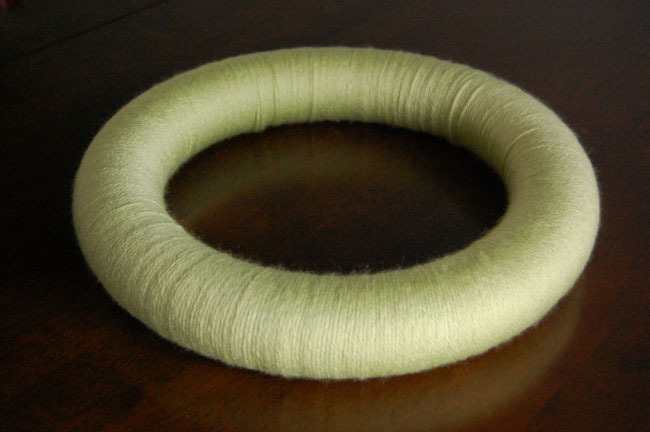 Take your yarn skein and wrap about 1.5 oz of it into a ball or about ½ of the yarn skein. Once you have your ball of yarn, cut it away from the skein. Tie the loose end of the ball yarn around your foam wreath. 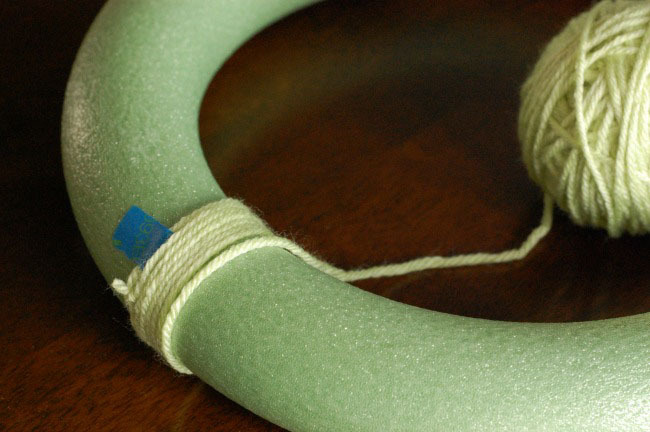 You may find it helpful to tape down this first loop to keep it from sliding around as you start wrapping your yarn around the wreath. Wrap in a counter-clockwise motion, doing a few wraps at a time. Make sure to keep the yarn from overlapping as you wrap. Push each wrap “section” you do up against the previous one so they cover the foam wreath completely. Going slow and steady will keep your yarn wraps neat and tidy! Continue around the entire foam wreath until it is completely covered in yarn. Once you reach the top, tie it off and cut off any remaining yarn. If you used a piece of tape to hold your starting loop you can remove it before you tie off the last loop. 2. 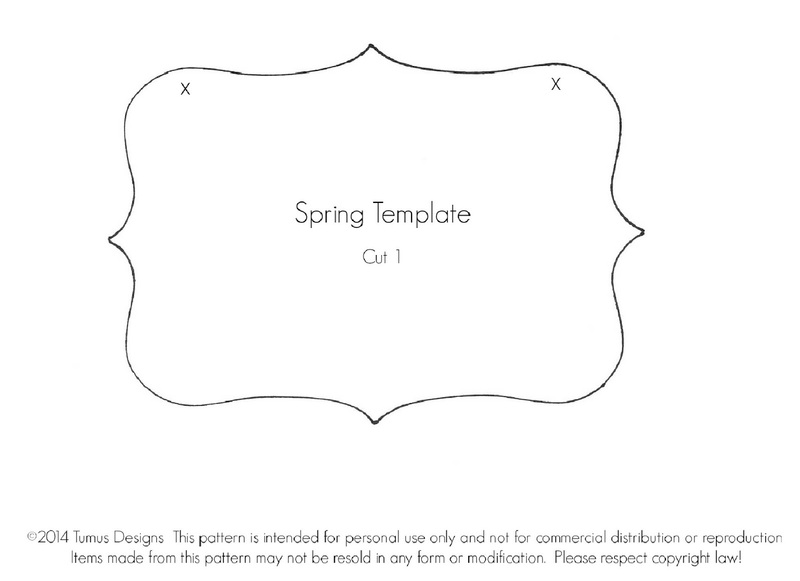 Cut out your Sign pattern from the template provided and use it to trace an outline onto your cardstock, make sure you mark where your holes need to go. 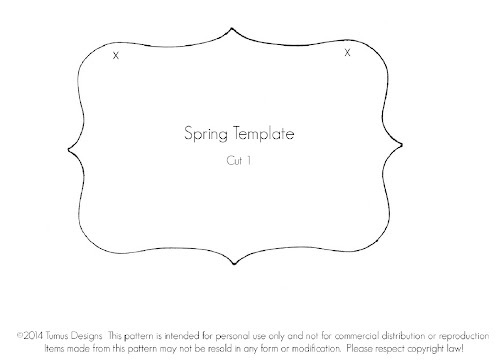 Cut out your cardstock sign. 3. 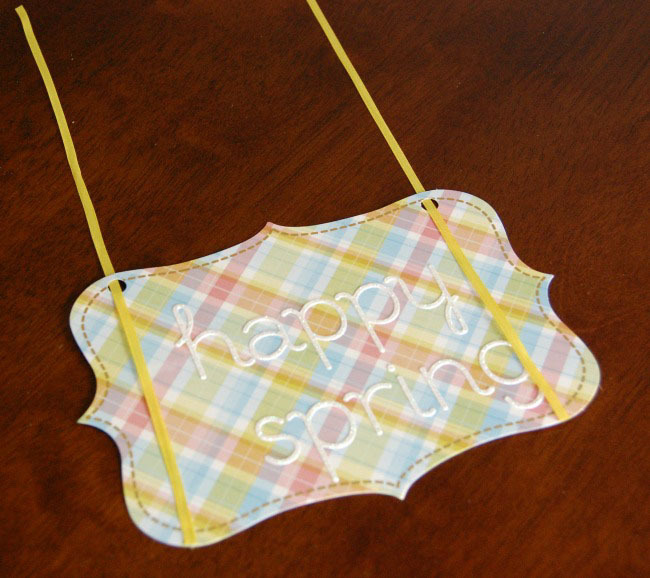 Decorate your sign by adding the phrase Happy Spring using either your sticker letters, like I did, or writing it out with your markers. 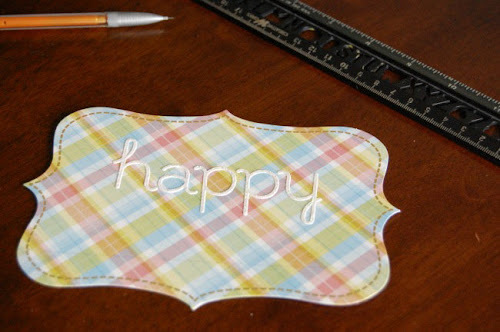 To keep your words straight, use a ruler and lightly draw a line across your cardstock then use the line as a guide to line up your letters as you go. Once you’re done simply erase the line. 4. Taking your yellow silk ribbon cut the length in half so you have 2 x 10.5” pieces. 5. Punch two holes where you previously marked. Turn your Happy Spring sign over and put a little piece of rolled up tape on the back then stick it to your work surface. This will help keep the sign from moving too much during the next step. 6. Pull one piece of your 10.5” yellow silk ribbon through each hole. You’ll want the end of each ribbon to touch the bottom of the sign. 7. 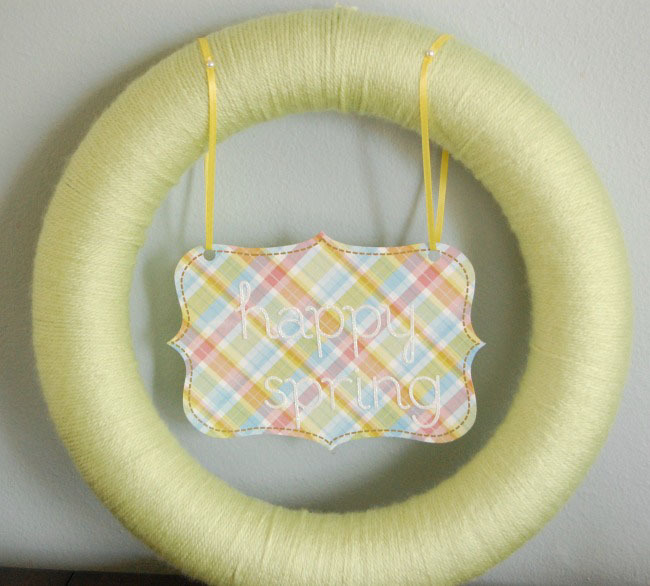 Place your yarn wrapped wreath over the Happy Spring sign. Make sure you find where you tied off your yarn loops from step 1 as you’ll want to keep them at the top (they’ll get covered later). The top middle point of your sign should be about 2-3” down from the inside of your wreath and your yellow ribbon should be under the wreath. 8. Grab 2 ball point sewing pins and set them close by. 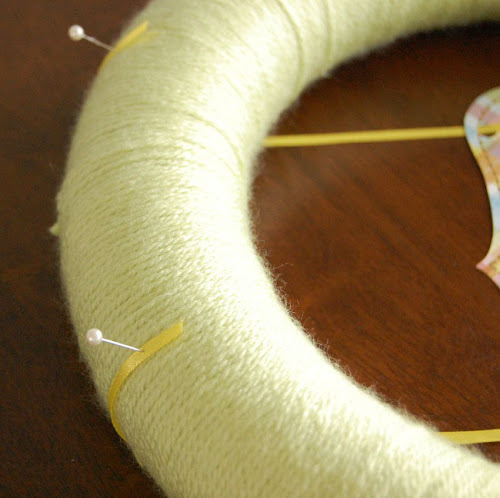 Gently pull one of the yellow silk ribbons up and over the outside of your wreath. Make sure your ribbon is not twisted! Pin lightly in place to hold it there. Repeat for the other ribbon. 9. 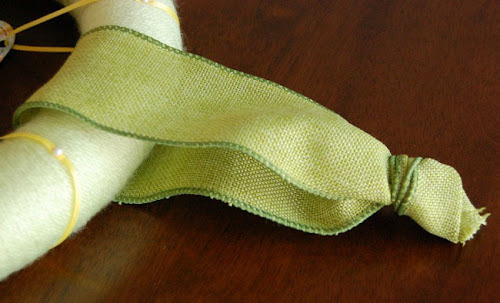 Next pick up the other end of one of the yellow silk ribbons (your interior one) and overlap it just enough to cover the other ribbon end that you just pinned down. Carefully remove your pin, keeping both ribbon ends overlapped and push the pin through both ends and all the way into the wreath until it is as close to the surface as possible. Repeat for the other ribbon. Once you’re done, gently peel up your sign and remove the tape from the back. 10. 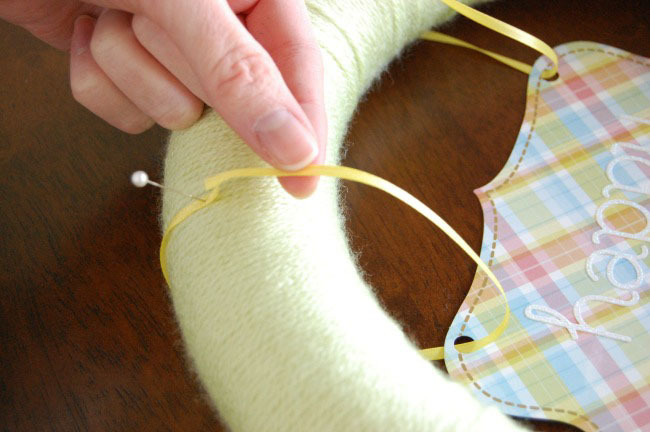 Heat up your glue gun and have your extra ball tip sewing pins nearby. Gather up your wreath, bunnies and your silk flower bunch. Start pulling off clumps of silk flowers. 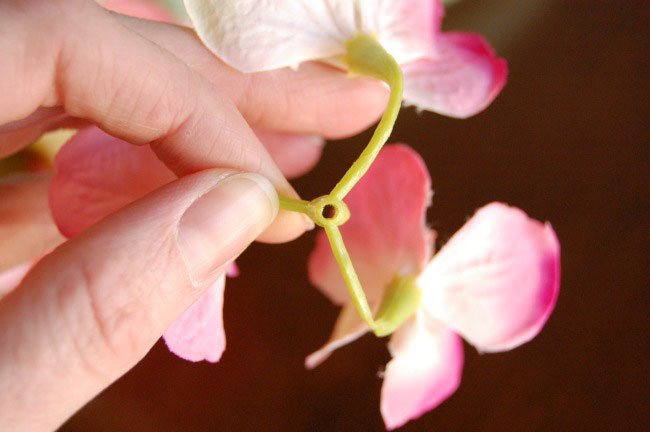 They should come off the stems readily and each grouping should have a “hole” in the center. This is where we will place the ball point sewing pin through to hold the flowers to the wreath. Keep a few flower bunches aside for step 13. 11. Once you have all your flowers plucked off do a “dry run” arrangement of how you’d like to have your bunnies and flowers placed on the wreath. It’s not necessary to glue or pin anything just yet. It might be helpful to take a quick picture of your final arrangement so you can remember where everything goes :) Then take just the bunnies off and set them aside. 12. Pin on your flowers. Pin enough flowers onto your wreath so you can arrange your bunnies around them again. 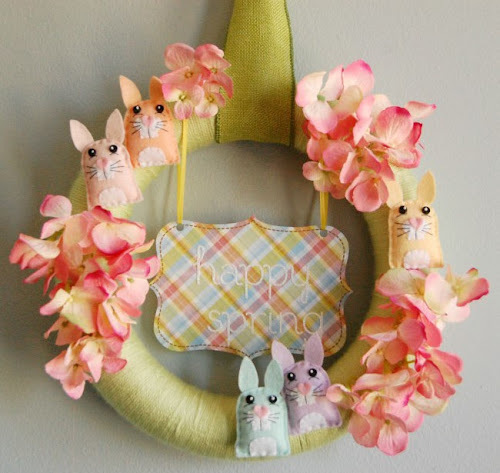 Once you have a few of your flowers pinned in place, take one bunny and add a dollop of hot glue or craft glue to the back side of your bunny and glue onto your wreath. REMEMBER that hot glue sets quicker than craft glue so make sure your bunny placement is where you want it to be prior to gluing. Also if using craft glue remember not to touch your wreath for a few hours and keep it lying flat so the craft glue has a chance to set. The bunnies will be permanent but you can always move your flower bunches around to get the look just right! 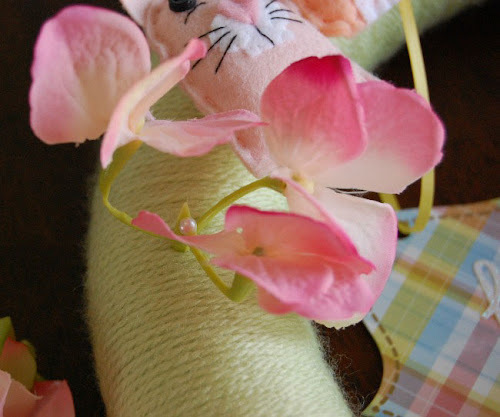 Continue gluing on the remaining bunnies and pin on any additional flowers you like. 13. Add your green burlap ribbon or green silk ribbon to the top of your wreath between the two yellow silk ribbons. Arrange it so that it is covering the yarn knot tie offs from step 1. Measure about 7”-8” (or longer if you need it) up the ribbon from the wreath and tie a tidy knot there. Cut off the excess and if using a silk ribbon dab a very small amount of craft glue or fray check on the end of the raw ribbon edge. Using the few silk flower bunches you set aside from step 10, pin these over the ball point sewing pins that are holding the yellow silk ribbons so that they are hidden. Hang your wreath anywhere inside your home and enjoy it throughout the Springtime until Summer arrives. Sweet idea :))) thank you, Laura!